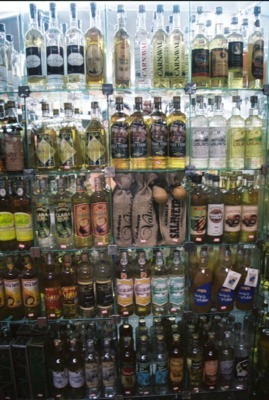 Cachaça, a Brazilian-style rum, is considered the "national drink" of Brazil, and is used to make the caipirinha, the "national cocktail." The State of Minas Gerais has some of the most reputable cachaças in all Brazil. Here is a collection of some of those cachaças at the Mercado Central in Belo Horizonte.